This is my entry for the derka competition. So, since it was black and white, i took it, and i fully revectored it in illustrator. i had to create from my head all the shadows and many of the folds in his cloth (especially inn the black area). also, for compositional purposes, i had to finish the cloth that is cut off in the original. so after a lot of time reCGing ths whole scan, there was much stock manipulation, and much mroe lighting effects added, and trees made from scratch and texturing and all that good stuff, until finally, i came up with what you see here. For more resolutions, check pixelated graffiti this saturday, assuming finals aren't sucking the life out of me. Proposed by and highlighted by OracleAngel. You are really cool with this wall, really PERFECT! I love it and it is really really the best wall i have ever seen from you ^O^ If i don't fav it, then i will get crazy days by days >_<! very nice job with the vector/re-cging and the firey scene. hope you luck on the contest! I love your flame effects and the excellent balnce between light and dark features. The text is done very well, and is a good pick. Great job! Wow. That is awesome. Outstanding job on vectoring the image and lighting effects. I love the text, that is very sweet. The only thing that looks a little strange to me is the tree. All I can see is this huge branch jutting out behind him, where's the trunk for the support? Other than, you've made a truly outstanding wall. I really like the fact that you can tell he's standing on stuff, but you can't determine exactly where and it doesn't seem wierd. Great work - Kudos! Oh just fabulous. *g* There has been a lack of Gin walls. Thanks for adding one. Wow, that's awesome. Love the fire and his pose. Never really thought of Gin being related to fire, but great job! Wee, so awesome! I like it a lot (not just bcos I like Gin =) ) The fire effect is great too. Thx and keep up a good work! I LUV Gin-taichooooou :hearts: :hearts: and more fangirl-ness. Another beautiful submission >_>. I'm amazed at the amount of work you put in this wallpaper. The vector of Gin alone would have been enough for it to be highlighted. It is beatiofully done and beautifully colored >_> . Also, apart from that, the whole composition is beautiful, and somewhat foreboding as well. I simply love this wallpaper, and it is really good. awesome wallpaper! Ichimaru-Taicho is one of my favourites in Bleach....very nice background, and the coloring/folding/and shading jobs on Gin are superb! good luck on ur competition! thanx for sharing, and keep up the great work! Beautifull wallpaper, we can really feel the dark evil side of ichimaru in your wall, great job. The BG is superb, gives a dark/evil feeling, and the quality of ichimaru is great, the colors are bright which gives a high quality felling to it. I think its the first time I see an Ichimaru wallpaper, beautifull work, keep it up! The fire is looking great. I also like the birds in the bloody sky. They're creating a threatening atmosphere. i love this wall,it is really some excellent work,and well done,i look forward to reaching ur level in making walls...thanks for sharing. Great work on this! You made awesome background and effects! Thanks for sharing! 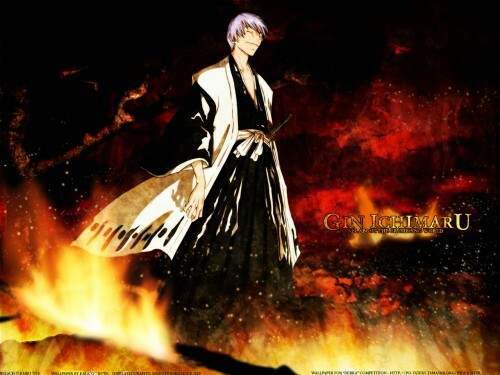 waai .. another cool bleach wallies , yep the flames look great and gin's pict is amazing too . The Bg is really fit the image too... hmm great work.. Fantastic, I love the small cinders floating up in the air, and also the coloring of the whole picture is uniform while still achieving a great amount of depth!